This intetesting result comes from a theoretical study of Earth-like planets orbiting white dwarf stars which found that we could detect oxygen in the atmosphere of a white dwarf’s planet much more easily than for an Earth-like planet orbiting a Sun-like star. A decade earlier, in July 2003, Hubble helped make the detection of a planet called PSR B1620-26b, 2.5 times the mass of Jupiter, located in globular cluster M4, which contains several tens of thousands stars and is noteworthy in being home to many white dwarfs—the cores of ancient, dying stars whose outer layers have drifted away into space. The PSR B1620-26 system lies around 5,600 light years away in the globular cluster M4, directly west of red supergiant star Antares in Constellation Scorpius. Its age is estimated to be around 13 billion years—almost three times as old as our Solar System, assuming the planet and its odd companions still exist. It is also unusual in that it orbits a binary system of a white dwarf and an ancient pulsar. Antares, is the first-magnitude star near the bottom of the image at the top of the page. 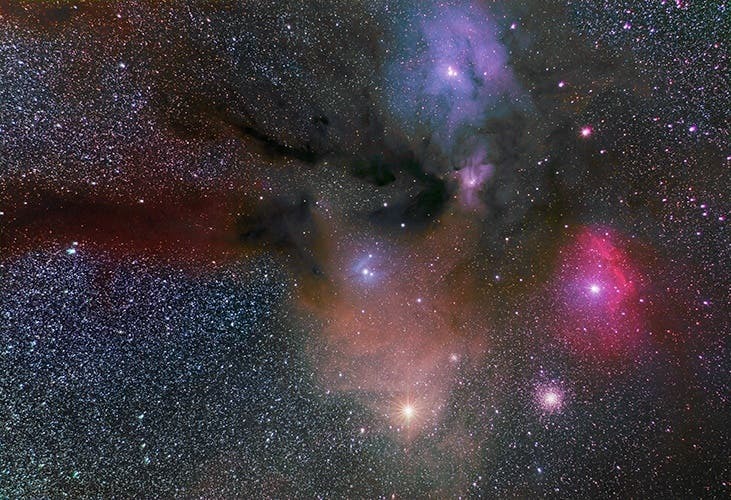 Above Antares is IC 4605, the blue reflection nebula around 22 Scorpii. To the left of 22 Scorpii is the dark nebula B44. IC 4604 is the blue nebulosity around Rho Ophiuchi, the triple star in the upper portion of the image. Below Rho Ophiuchi is the blue nebulosity of IC 4603. Sh 2-9 is the red emission nebula associated with Sigma Scorpii, the blue star near the right edge of the image. Below Sigma Scorpii and to the right of Antares is the globular cluster M4. To the upper right of Antares is the smaller globular cluster NGC 6144..
A globular cluster might be the first place in which intelligent life is identified in our galaxy, observed Rosanne DiStefano also with the Harvard-Smithsonian Center for Astrophysics (CfA) in January, 2016. Globular star clusters, which are found in the halo of the Milky Way, contain considerably more stars than the less dense galactic, or open clusters, which are found in the disk. They’re densely packed, holding a million stars in a ball only about 100 light-years across on average. They’re old, dating back almost to the birth of the Milky Way. And according to new research, DiStefano speculates, they also could be extraordinarily good places to look for space-faring civilizations. The predominant stars in globular clusters are faint, long-lived red dwarfs. Any potentially habitable planets they host would orbit nearby and be relatively safe from stellar interactions. “Once planets form, they can survive for long periods of time, even longer than the current age of the universe,” explains Di Stefano. Such a civilization would enjoy a very different environment than our own. The nearest star within a globular cluster could be about 20 times closer than in our solar system— just 1 trillion miles away, making interstellar communication and exploration significantly easier. “We call it the ‘globular cluster opportunity,’” says Di Stefano. “Sending a broadcast between the stars wouldn’t take any longer than a letter from the U.S. to Europe in the 18th century. The existence of a 13-billion year old planet highlights the fact that our Solar System exits in a universe that is estimated to be between 13.5 and 14 billion years old. A few intrepid astronomers have concluded that the most productive to look for planets that can support life is around dim, dying stars white dwarfs so prevalent in M4 shown. When a star like the Sun dies, it puffs off its outer layers, leaving behind a hot core called a white dwarf. A typical white dwarf is about the size of Earth. It slowly cools and fades over time, but it can retain heat long enough to warm a nearby world for billions of years. Since a white dwarf is much smaller and fainter than the Sun, a planet would have to be much closer in to be habitable with liquid water on its surface. A habitable planet would circle the white dwarf once every 10 hours at a distance of about a million miles. Before a star becomes a white dwarf it swells into a red giant, engulfing and destroying any nearby planets. Therefore, a planet would have to arrive in the habitable zone after the star evolved into a white dwarf. A planet could form from leftover dust and gas (making it a second-generation world), or migrate inward from a larger distance. NASA’s James Webb Space Telescope (JWST), scheduled for launch on March 30, 2021, promises to sniff out the gases of these alien worlds. Loeb and Maoz created a synthetic spectrum, replicating what JWST would see if it examined a habitable planet orbiting a white dwarf. They found that both oxygen and water vapor would be detectable with only a few hours of total observation time.